Come join us at Dat Cajun Place every Friday at 5 PM to taste the best mud bugs this side of the Mississippi. 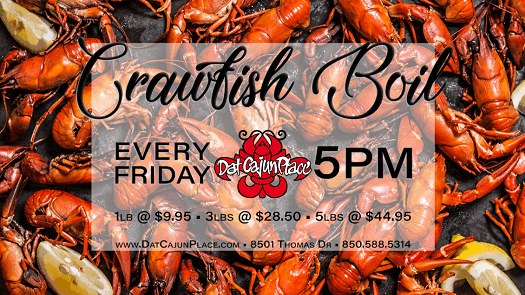 Join us every Friday night at Dat Cajun Place for our locally famous Crawfish Boil! Get it by the pound starting at only $9.95 . Get 3 pounds for $28.50 & 5 pounds for $44.95. Every order comes with its own portion of mushrooms, sausage, corn & potatoes. It is something every one should have at least once in their lifetime. Come on in and give us a try, if you have trouble with the mud buggers, just ask any of our �talented� staff to show you how! They never mind, it�s a nice little snack break for them!! Come on by, 8501 Thomas Drive, Panama City Beach, FL. 32408, or give us a call, 850.588.5314, if you have any questions. Like us on Facebook to receive standard updates on events and happenings around the area!